...record data, control system operations, communicate with networked devices, measure at flexible intervals, and more. What if your sensors could send you instant updates? What if they had their own memory, and could talk to other devices? What if they even compensated for interferences? You’d always have reliable information at your fingertips. You would use less valuable time maintaining and managing your data, and have more time interpreting it. You would make smarter decisions — decisions that could be the critical difference between environmental safety and disaster. PT2X Submersible Pressure/Temperature Smart Sensor – measures pressure, temperature, level and time. PT2X-BV Barometric/Vacuum Smart Sensor – ideal barometric reference for absolute versions of PT2X pressure sensors. CT2X Submersible Conductivity/Temp. Smart Sensor with Depth/Level Option conductivity, temperature, time and depth. 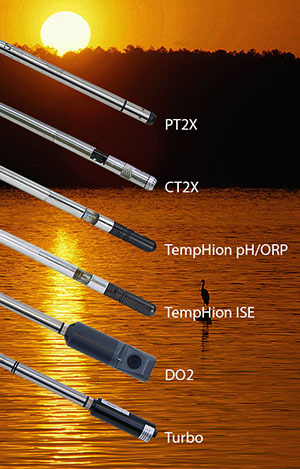 TempHion™ Submersible pH/ORP Smart Sensor – for continuous pH and ORP monitoring, plus temperature and time. TempHion™ Submersible ISE Smart Sensor – chloride or bromide sensing for unattended in-situ pH testing. DO2 Dissolved Oxygen Smart Sensor measures and records dissolved oxygen and temperature internally. Turbo Turbidity Smart Sensor – measures and records turbidity and temperature. Timing and accuracy are critical when monitoring water resources. How quickly can you analyze your data and make the right decision? AquiStar’s technology is designed to make your data work for you with convenient integration, efficient systems and versatile software. Industry standard RS485 interface allows for easy networking with other AquiStar® Smart Sensors as well as with WaveData® wireless data collection systems. See the AquiStar® Smart Sensor Product Features Chart. 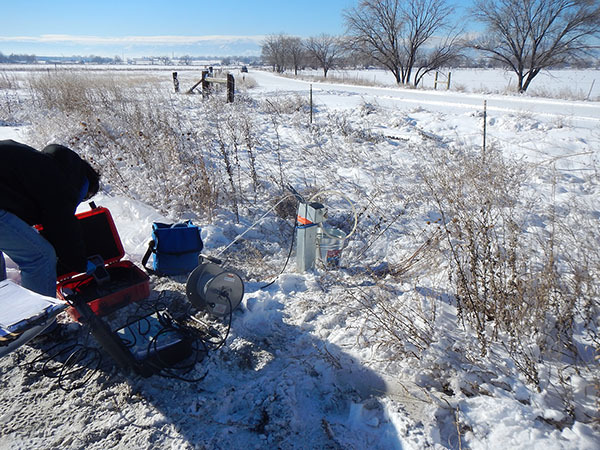 Gage Gregory, Project Manager with CGRS, Inc., took this picture while using a low flow Geotech SS Geosub and Controller to sample groundwater for the Union Wells Groundwater Project. Mark your calendars for the 116th National Western Mining Conference, to be held April 14-17 at the Colorado Convention Center in Denver. This event will be your chance to learn about the very latest in mining in the mining expertise capital and home to many major company headquarters. Take advantage of networking and business development opportunities with representatives from every mineral industry in Colorado, purchasers, top level executives, vendors, and suppliers. Look for us at Booth 404. The Environmental Trade Fair and Conference (ETFC) is Texas' premier environmental educational forum featuring topics such as the drought crisis, oil & gas, air quality, waste management, and many more. Visit Geotech at Booth #1514. The conference is a cooperative effort to promote technology transfer and regulatory awareness in the oil and gas industry. To achieve this goal, sponsoring organizations work together to provide a two-day conference of seminars pertinent to "what's going on now" in the industry. Along with the conference, there is an exposition for professionals to exhibit their goods and services. Join us in the Florida sun for a full day of technical sessions from leading experts in the cleanup business. The conference features continuing education credits, excellent networking opportunities, and over 30 companies exhibiting their products and services. Geotech will be in Booth #18, see you there! Prices and promotions mentioned in this newsletter are valid through March 31, 2014.